A wide selection of exciting adventures... Yours for the challenge...! 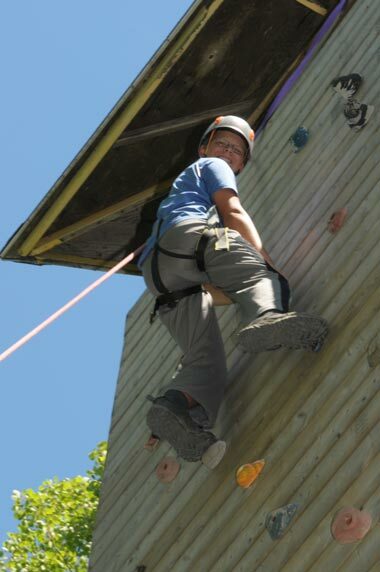 Camp Claret offers teenage boys the opportunity of experiencing an intense team life where friendship and adventure are the key words. Thrilling activities and new challenges will be occasions to develop responsibility and increase self-confidence. The higher the goal, the harder the climb, but taken each day, one step at a time, guided and encouraged by his counsellors, the goal is accomplished, the dream is attained, and the prize? The Wisdom, Strength and Character that are gained! Highlight of their experience at Camp Claret. Backpacking trips are designed to teach outdoor skills and foster self-achievement through team-building. It is our goal to provide an experience in which each participant may develop mentally and physically. We wish to empower our teenage boys with a healthy dose of self-confidence. Moreover, the 2-day canoe-camping Rally on Lake Elgin allows campers to practice their new learnt skills in orienteering, and succeed the challenge of crossing the lake through teamwork and will power. Learning to go beyond yourself... through effort! It takes strength to be courageous and courage to be strong! To know the dates and fees of our 2 week sessions, please CLICK HERE!